MINNEAPOLIS, MN, March 14, 2018 – Banner Engineering, a leading provider of technology for industrial automation, today announced the release of VS8 Series Miniature Sensors for precise detection in applications with extremely limited space. Sensors in the VS8 Series have a space-saving form factor (21.1 mm x 14.6 mm x 8 mm) for use in confined spaces and near moving parts. They are available in red laser, red LED, or blue LED models with opposed, retroreflective, adjustable or fixed-field background suppression sensing modes. This versatility allows companies to match the sensing technology to the application. 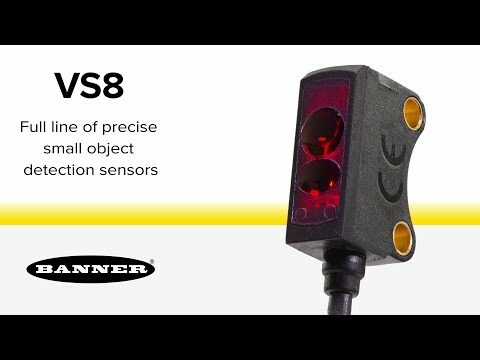 VS8 Series sensors detect very small parts and other difficult targets that challenge many sensors. Red laser models have a bright, precise spot for detecting multicolored targets and objects as small as 0.5 mm. Blue LED models reliably detect targets with dark or reflective surfaces and transparent objects without requiring a reflector. Red LED models are cost-effective, multi-purpose sensors that detect a wide range of targets. Industry standard side mounting holes with 15 mm spacing facilitate installation on new or existing equipment. The dovetail mounting option allows ±10° tip/pivot adjustments for quick, precise alignment of the sensor. High-visibility status LEDs, electronic push-button and remote input teach make it easy to program the sensors. These features support rapid integration and simplify operation. The VS8 Miniature Sensor installs in the smallest of spaces. The red laser models provide bright, precise laser light spot for optimum small part detection. High switching frequency for detection in even the fastest processes. The sensor has user-friendly operations, using electronic push button or remote input to provide reliable and precise detection. Multiple models to choose from including red laser, red LED, and blue LED versions to solve challenging applications. ECOLAB certified and IP67 rated.